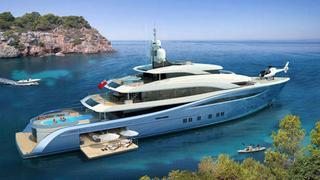 UK-based Tony Castro Design has released details and renderings of a new 65m superyacht project. The layout of the 65m was conceived to offer a spacious living arrangement to all guests and the owners' private top deck features a spa pool and panoramic views. The mast houses a crows-nest. Special attention has been paid to the hull design, using the latest techniques to offer exceptional levels of comfort alongside excellent sea-keeping. The bridge deck boasts full-height windows aft, bringing in ample sunlight and fresh air with excellent views. Access to the touch-and-go helipad is on the foredeck. The main deck has a large pool and sunbathing terrace. Below, there is a large beach club with fold down bulwarks, ensuring space for relaxation and easy access to water toys.